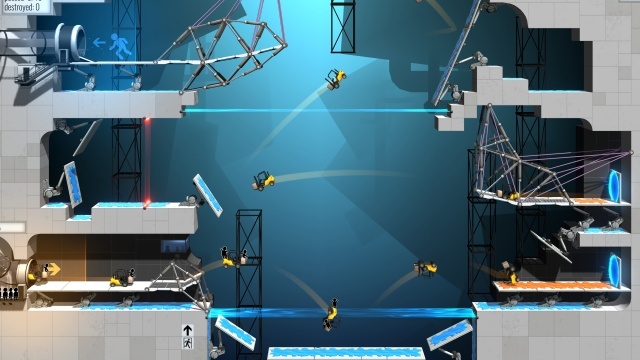 Bridge Constructor Portal is more Bridge Constructor than it is Portal, but the opportunity to return to Aperture Industries and subject yourself to the trials of GLaDOS in the name of science is still welcoming. Each level, excuse me, experiment, challenges you to construct a series of bridges and ramps such that a car sent into the level's entrance will make it safely to and out of the exit. Constructing bridges is easy enough. You'll be able lay down the bridges by attaching the bridge segments to cross gaps and then build supports using pylons and cables by attaching them to the bridge and the level's support points. While putting a bridge together is easy enough, building one that will hold up to vehicle traffic is another matter. You need to ensure that the supports distribute the weight enough so that too much load isn't put onto a single support which will cause it to fail and send your bridge crashing down. Things are further complicated by the addition of portals to the levels. As in the Portal games, entering one portal will send you out of the connected portal with the same momentum that you had entering the first. Instead of one blue and one orange portal, though, you'll have multiple portals to contend with, with connected portals designated by the same matching color. Since all levels are two dimensional, cars traveling from one portal to another will need to crisscross the level back and forth. This means that they'll need a clear path through and can't have a bridge blocking the path of the cars. You'll need to make use of ramps or place gaps in your bridges that can be safely traversed by cars that have built up enough momentum to jump the gaps. It will take both some thought and a little trial and error before you create a system of bridges and ramps that will allow a car to safely pass through a level. Each level in the game is completed when you get a car all the way through it, which will unlock the next level for you to play. For an extra challenge, you can send a convoy of ten cars through a level. This makes the construction a little trickier, because you have to contend with cars flying through your level in different directions simultaneously. Also, if your supports don't evenly distribute the load, you can build up stress fatigue in a support, eventually causing it to fail before the last car makes it across. Those of you who enjoy an extra challenge will want to successfully get an entire convoy through a level, but if that proves a little frustrating you can simply take your one car win and move on. In general, I didn't find it too difficult to solve each puzzle for the single car case, but the ten car solutions were decidedly trickier. If you're looking for a new chapter in the Portal saga, Bridge Constructor Portal won't give you that. There's a little of that trademark GLaDOS dark humor before each level, but the game is really a sequence of puzzles rather than a contiguous story. I didn't mind that, though, I enjoyed the challenge of the puzzles (and to be honest, it was also fun watching everything collapse in spectacular fashion as a convoy was trying to get safely across) and it's always a treat to listen to GLaDOS, voiced as in the Portal games by Ellen McLain. You don't have to be a Portal fan to enjoy the game, just a fan of physics-based puzzle games. And if you are a Portal fan, while the game isn't exactly Portal 3, it's nice to be able to make a brief return to Aperture Industries anyway. Final Rating: 80% - You and GLaDOS, building bridges together.